These cinnamon rolls not only taste scrumptious, but they also freeze wonderfully and can be reheated in the microwave. This recipe for a dozen cinnamon rolls can be made with raisins, or without. Although the vanilla ​frosting glaze isn’t really necessary, it’s an easy last-minute addition that will send your rolls over the top. In other words, highly recommended for pure cinnamon roll bliss. 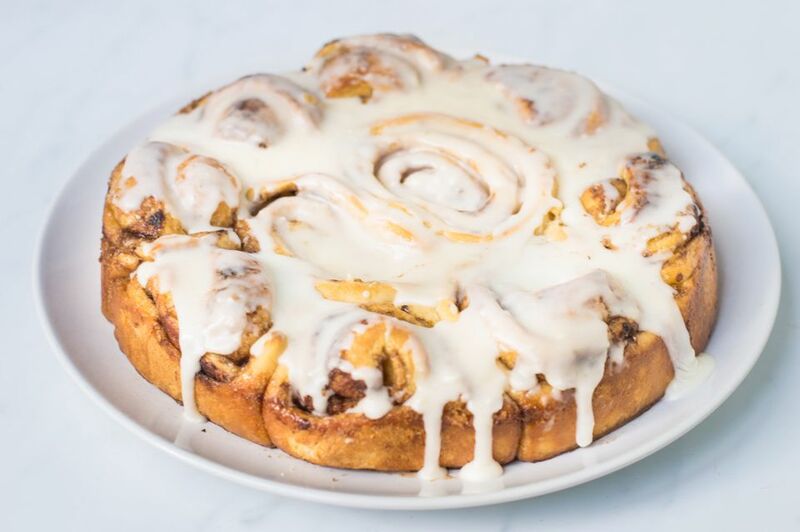 Note: while there are multiple steps to this recipe, this cinnamon roll recipe is broken down into workable categories to help you better plan for baking. Scald milk, then pour over the shortening. Add sugar and salt and cool to tepid. Add the dissolved yeast and beaten egg. Add 4 cups flour adding one at a time beating after each addition. The dough should be soft yet firm enough to handle. Knead on floured board until elastic and smooth. Avoid too much flour. Turn dough into a well-oiled bowl and let rise for 1 1/2 hours. Press dough down and divide into a workable size. Roll dough out into a rectangle. Cover with melted butter. Layer generously with a thick layer* of brown sugar. Sprinkle on cinnamon* as desired. If you like raisins sprinkle a layer. Using scissors or a piece of string, cut off slices about 1 to 1 1/2 inches thick. Place slices in an 8 or 9 inch round greased cake pan. Place one slice in the middle and other slices around it. Press rolls down to even out and fill the pan. Let rise until rolls fill the pan generously - about another hour. Bake in a 350 F oven about 15 to 20 minutes. If rolls get too brown, cover with a piece of tine foil until the end of baking. Do not overbake rolls. Immediately remove from pan by inverting onto a plate and then tip over onto another plate to right the rolls. In a medium bowl, place sugar, butter, and vanilla. Then stir in enough milk or cream to reach a thick, hardly able to stir consistency. Spread over warm rolls as soon as they are placed on a plate to let the frosting melt and run into the rolls. Be generous with both the brown sugar and cinnamon. This will give you about a 1/2-inch layer of brown sugar completely covered with cinnamon. You can use the dough as a refrigerator dough and bakes the rolls the next day!